Nazlina Hussin. Yes, that's me. A few years ago, I wrote this description about myself. Now, because of current developments, I have to update the story. When I started this web site, I had no clue it would grow into something like this. That I would get readers from all over the world, that it would also help launch a professional career and would include an appearance on television. I never call myself a chef, after all, I never went to any culinary school. What I lack in paper qualification, I make it up through reading, interacting with other fellow cooks and practicing the skills, over and over again. Because of this, people from all over the world come to cook with me. I have food journalists, restaurant owners, chefs, food critiques and foodies as my students. It is a great experience! Below is a snippet where I taught a Michelin star Chef, Atul Kocchar how to make nasi lemak. Numerous online publications link to this website. Other newspapers from abroad also published my story. Our own Malaysian Airlines in-flight magazine: "Going Places" also printed a story about me in their August 2010 issue. Air Asia had me covered in one of their inflight magazines. 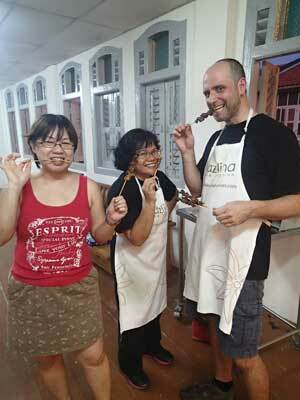 Upstairs we do from Monday to Saturday cooking classes while downstairs we have afternoon cooking demonstrations, walking, heritage and food tours plus an additional range of hiking and nature tours in Penang and Perak available. You can also contact me directly if you wish. What is the difference between herbs and spices Find out here. Learn to make biryani step by step with photos. It is a good practice for you to learn about these spices.